Thank you. Good morning, ladies and gentlemen. It’s my great honor to have this opportunity to join this very special symposium. Today, I would like to show you some results on how to use the CVD technique to grow carbon nanotubes. But before my talk, I’d like to say some words about Millie. 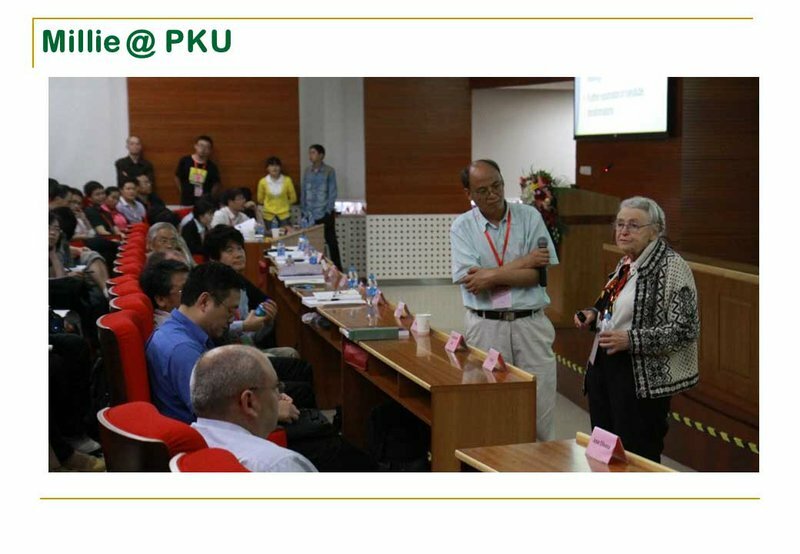 As you know, I come from Peking University — and Professor Millie Dresselhaus visited our university several times and joined us for some of our symposiums. 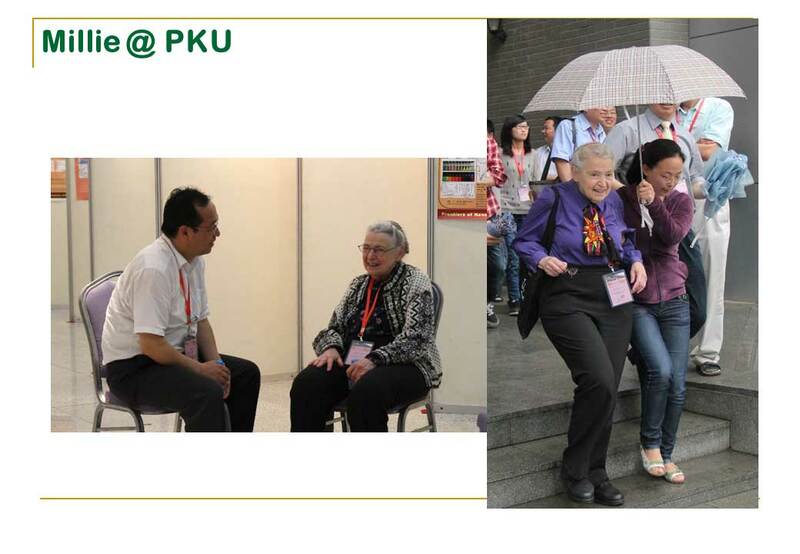 These are some pictures that were taken at our University (and there will be more spread throughout my talk, today). In the photo above, you can see Millie presenting a talk. Millie was a very good speaker, a very animated speaker, and she was always good at being able to read a room and tailor her talk to that specific audience. Here, you can see her sitting alongside some famous professors, as they asked questions of the students presenting. In these pictures, Millie is walking around and discussing the things she’s heard. Millie was always very busy, you know. And she liked walking. This is a poster session for the students, and, of course, Millie was there! She was always there. 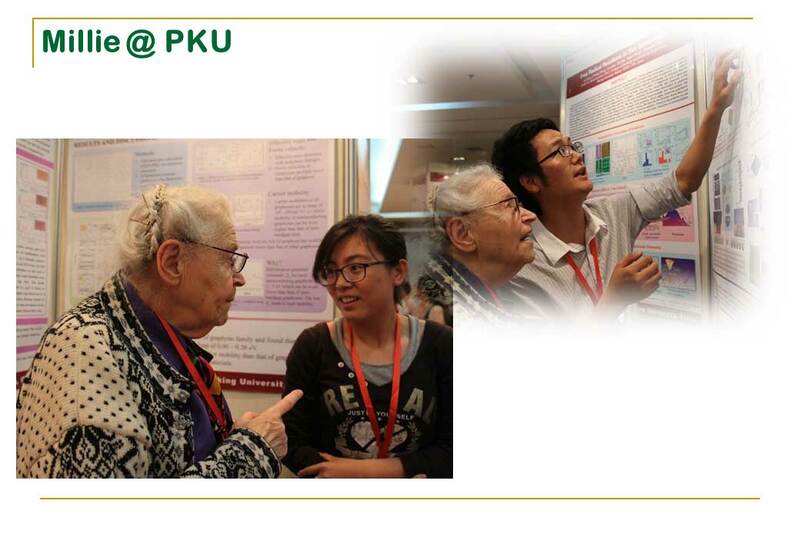 She always attended the poster sessions. But what is really interesting is that you can see, in these photos, how carefully Millie looked over each poster. She analyzed and studied them, and then she asked the students probing questions about them. This is Millie at a banquet held at the symposium. You can see her toasting, here. By the way, the clothes Millie wore were always important, too — that scarf, for example, was created for her by a student working on solar energy. She liked to wear it because it reminded her of her student. 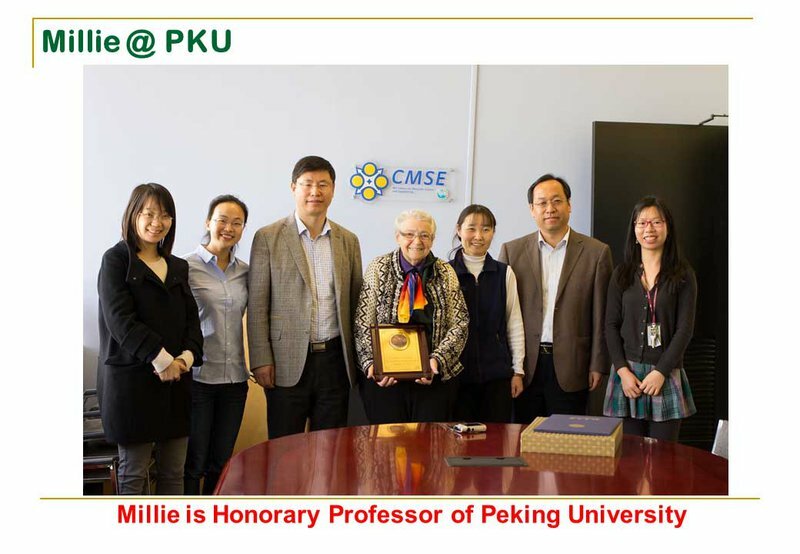 Now, you may not know this, but we at Peking University consider Millie to be one of our own! Yes! She is an honorary professor of Peking University. We are all very proud of that. 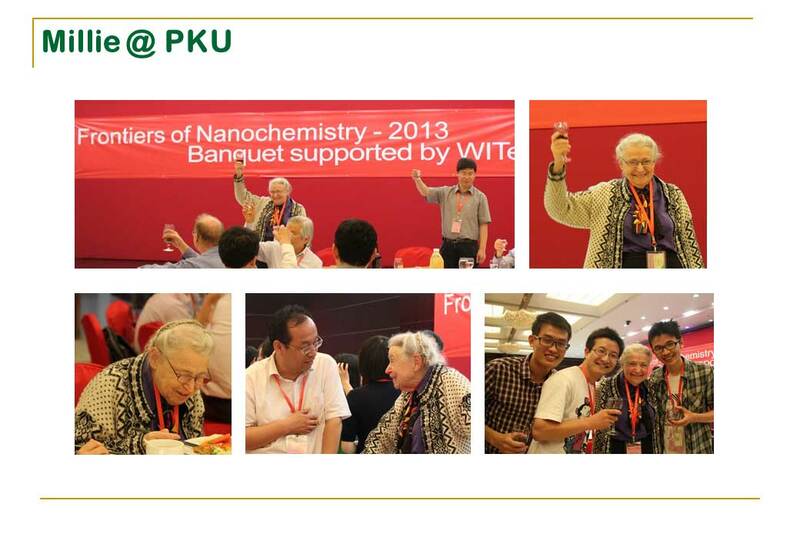 Our group at Peking University has had a long and very productive collaboration with Millie. 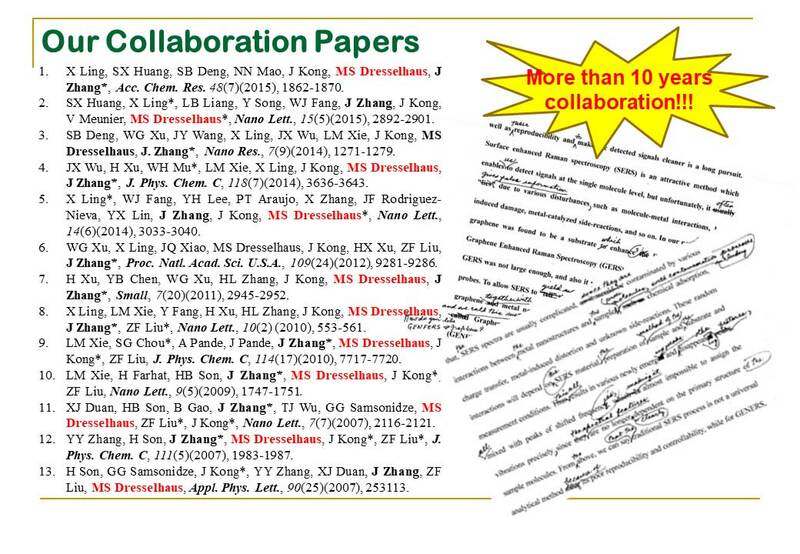 We’ve produced more than 30 conference papers with Millie, over the course of roughly 10 years. And of course, all the papers were edited by Millie. Millie read everything. Her notes were always very comprehensive and very good. You see, above, an example of some of the handwritten notes she gave us. 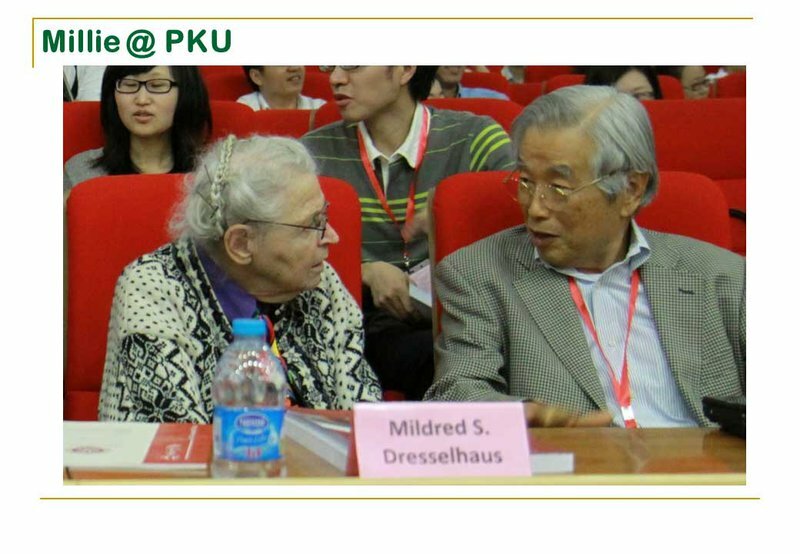 We are very thankful for all the help and support that Professor Millie Dresselhaus gave us, over the years. We are going to miss her terribly. 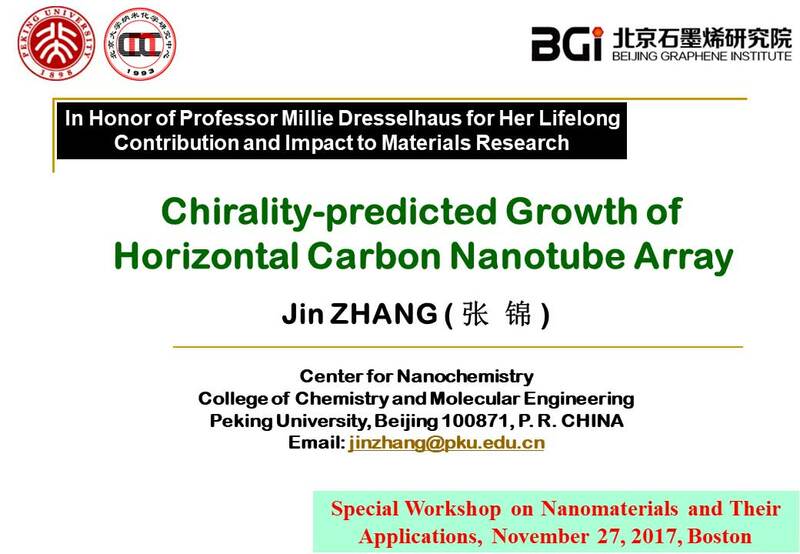 Today, I wish to show you some of the results we’ve gotten on how to use CVD in order to create controlled growth in carbon nanotubes. Ideally, we would like to use carbon nanotubes inside of high-tech devices in the future. But if you want to use carbon nanotubes industrially like that, you must first grow them in a controlled way. What do we mean by controlled? Three things. First, they must be aligned with the surface upon which you are growing them. Second, you must be able to grow the nanotubes with a density high enough that the growth process is economical. And third, you must control the structure of the nanotubes while they’re being grown. How do we do these things? Well, in my talk today, I will show you two examples of our recent work. 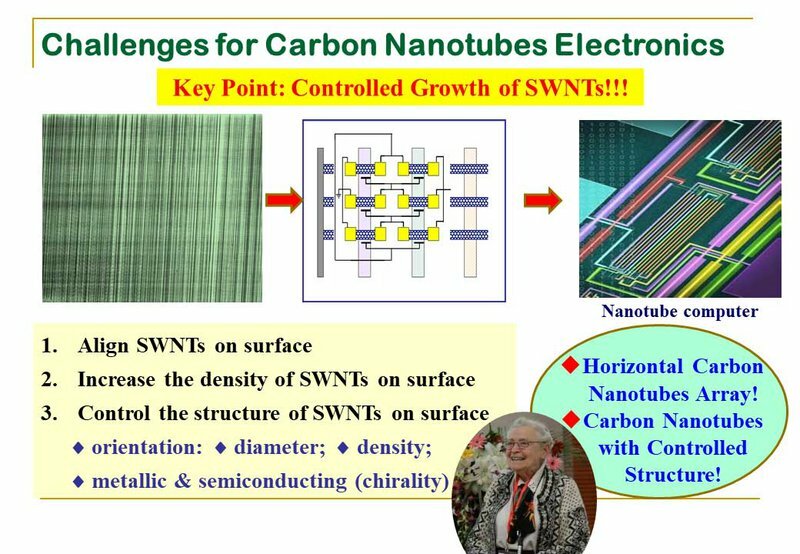 First of all, how do we grow carbon nanotubes? As you can see on the slide above, this is our motivation! Over the last ten years, we have been working on perfecting a way in which we can grow a high density of nanotubes on a surface, all aligned, and all of which are good industrial types of semiconducting single-walled carbon nanotubes. The process works like this: if we choose a substrate, place the catalyst on the surface, and then use the CVD growth mechanism, this will allow us to align the nanotubes properly onto the surface. How about density? Industry isn’t going to run out to the store and buy different sized surfaces to grow nanotubes! 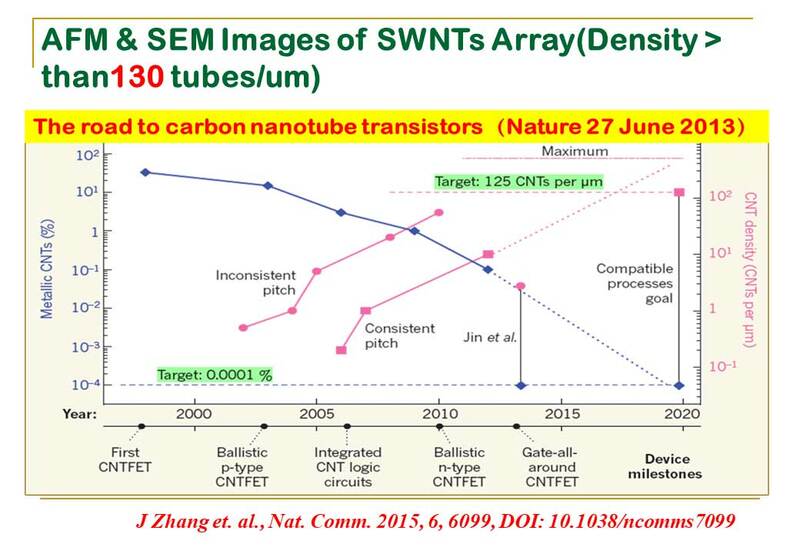 To get enough nanotubes for industrial applications, we have to increase the density. But how do we grow a high enough density of nanotubes? Many people around the world are working on this problem, and there tend to be two different ways to do this: using in-situ growth and using post-treatment growth. In the in-situ growth methods, we could use either direct growth, multiple-cycle growth, or growth process with a multiple loading catalyst. In-situ methods, however, are not very good at creating large numbers of nanotubes — using these methods might cause the density to be as low as 15 tubes per micrometer! In the post-treatment methods, some people can grow more than 500 tubes per micrometer — which seems much better. However, the nanotubes produced by these methods tend to be short and not well aligned. In summary, with post-treatment methods, the quality of the nanotubes is just not good enough for high-performance devices. The CVD process uses a catalyst as a very important factor for growing nanotubes on a substrate. The problem is that during the nanotube growth process, the catalyst clumps together and aggregates. 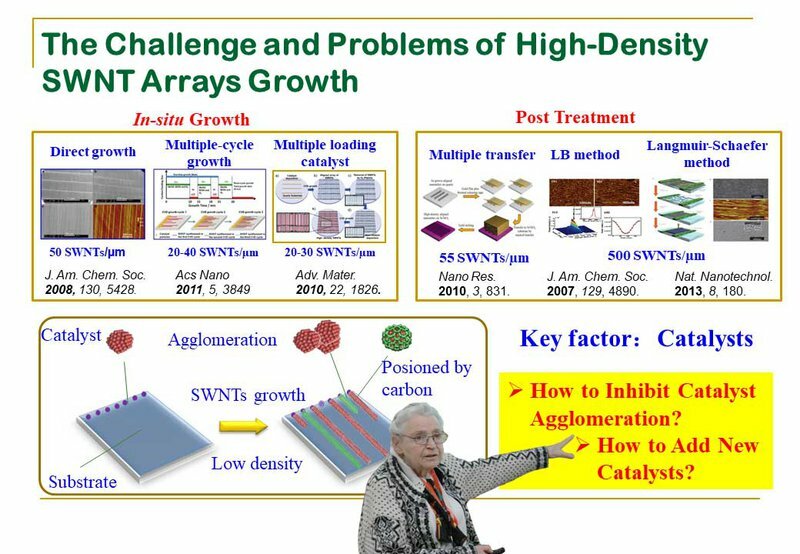 So the question really is whether or not we can avoid that catalyst aggregation during the nanotube growth process. Could we, perhaps, add a new catalyst that will not aggregate? Here, we’ve just developed one way. We call it the Trojan catalyst. How does this work? If we have a substrate, we put the catalyst on the surface and then use some heat to dissolve the catalyst into the substrate, and then, while the nanotube is growing, you can use a hydrogen atmosphere to release the catalyst into the atmosphere gradually. The gradual process allows us to avoid the aggregation of catalyst during the nanotube growth. 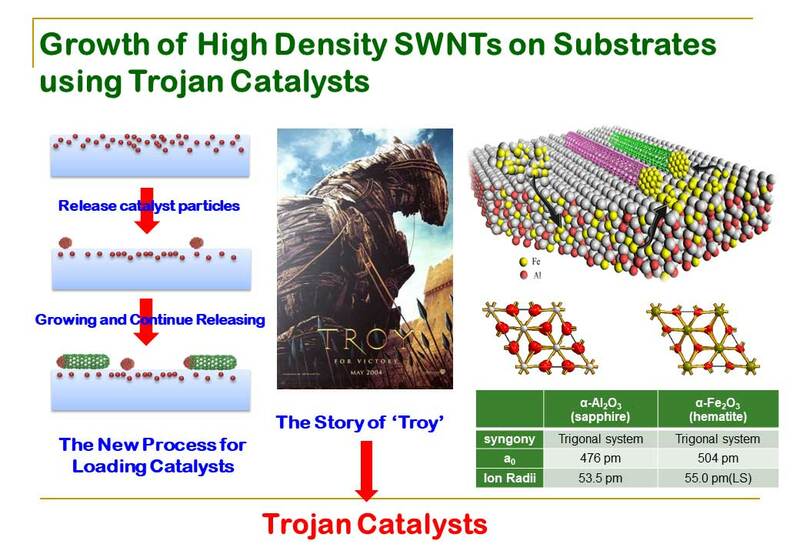 Why call it the Trojan catalyst? When the catalyst dissolves into the substrate, it sort of ‘hides’ inside the substrate until the growth process begins, at which point the catalyst leaps out and attacks. This is very similar to the Greek army in the Trojan War, when they created the Trojan horse. I know the moral of that story is, “Beware of Greeks bearing gifts”, but we actually love these gifts. We want more of these gifts! In this system, we use a silver aluminum oxide substrate. The ferric-oxide is the catalyst, and we put this catalyst on the top of the substrate at a very high temperature. The diameter of aluminum and iron is similar, which you can see in the slide above. Exchange happens between two ions (aluminum and iron). 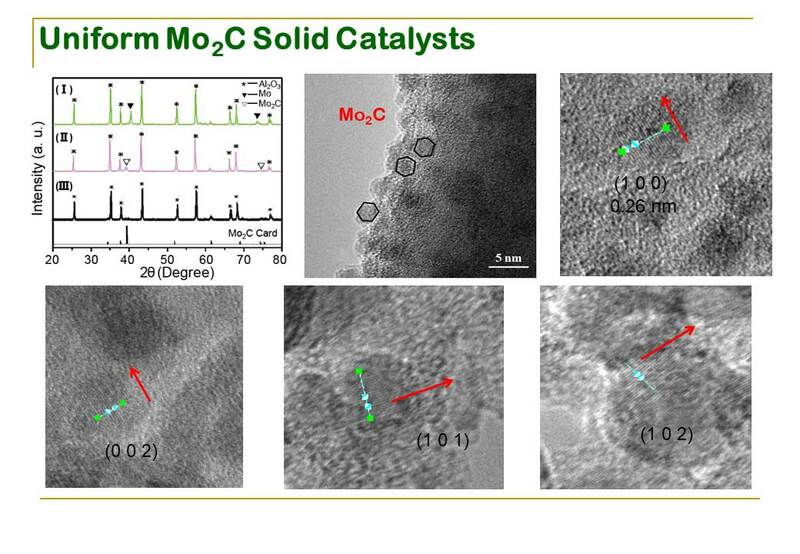 Used in this way, we can store the Trojan catalyst inside of the aluminum substrate. 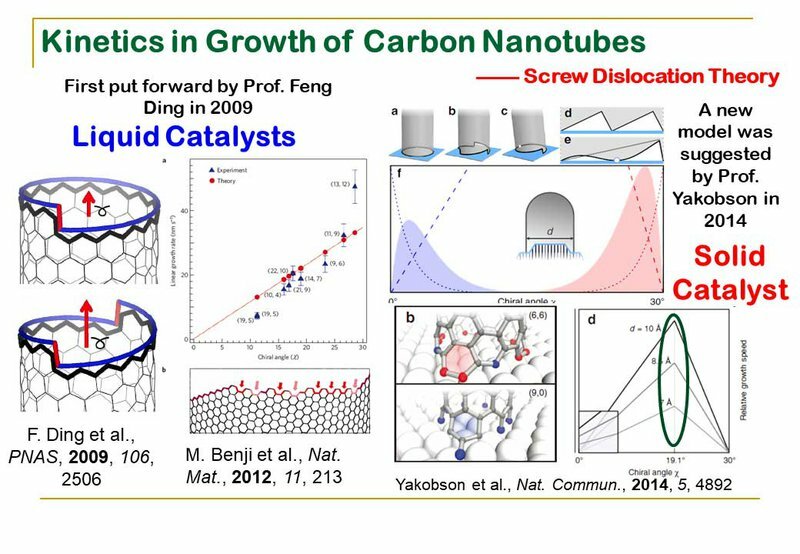 During the nanotube growth, if you give the carbon source time, the catalyst will be released from the substrate. 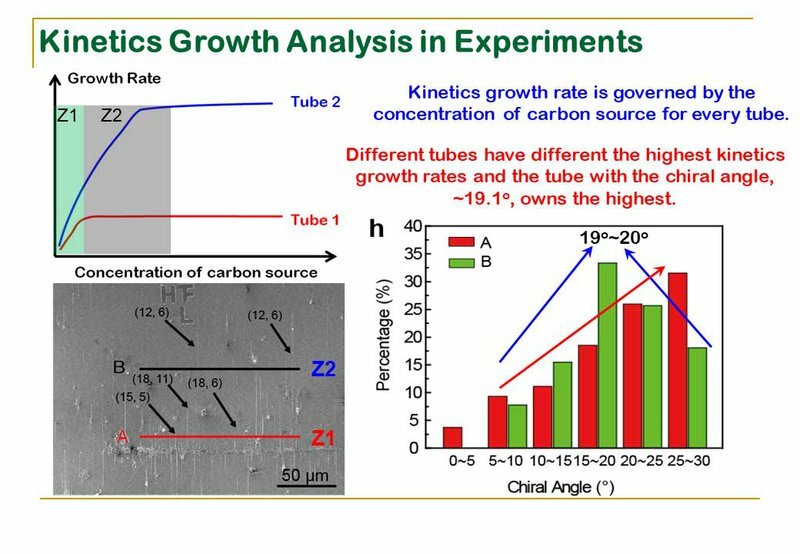 Using this method, the density of growth can be more than 100-130 tubes per micrometer! This is a very good result and it produces very large and high quality nanotubes. You may have read the paper in Nature about this Trojan catalyst. 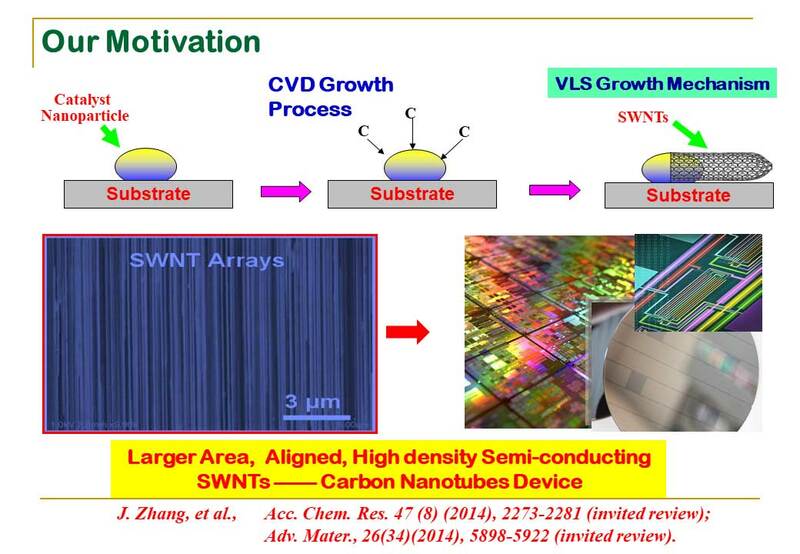 That paper is very important, because it gives us a roadmap by which we can create carbon nanotube transistors. By the year 2020, we should be able to get a tube density that is more than 125 tubes per micrometer — and all of those tubes will have semiconducting properties (not metallic properties). Why is that attractive? Because, using this, we can build computers out of carbon nanotubes! That’s very attractive to industry. But this does contain a hidden problem. 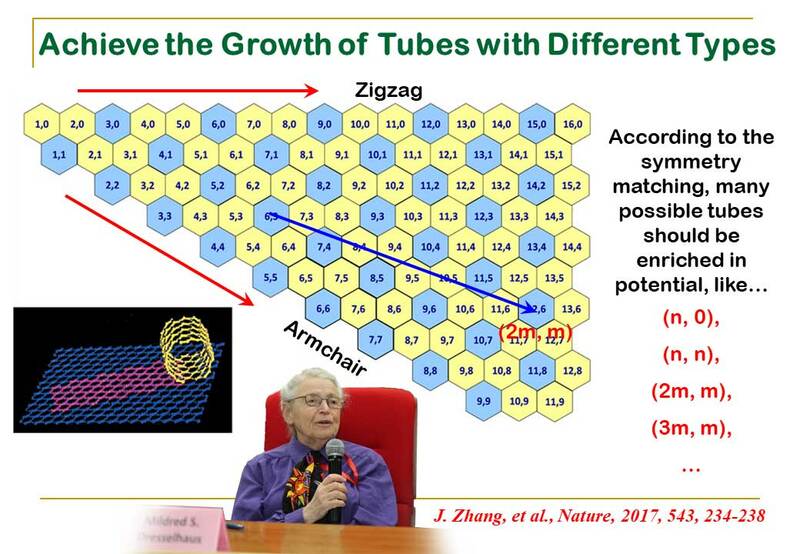 Right now, we can get a very high density of tubes to grow on the surface, and all those tubes are very high quality — but we still cannot get all of the tubes to have semiconducting properties. This is one of the challenges of nanotube growth. Notice the periodic table on the slide above. 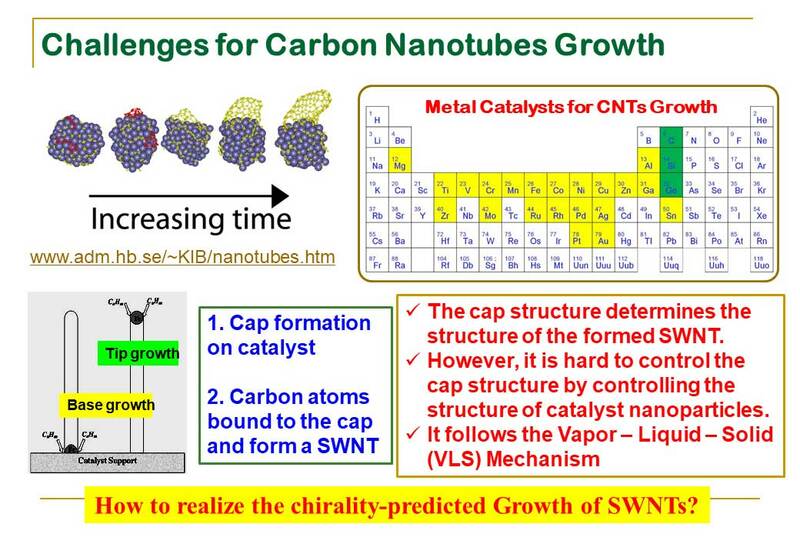 I’ve highlighted the metals used as catalysts for carbon nanotube growth. It’s interesting to note that most of the metals on the periodic table are currently being used in the growth process for carbon nanotubes. 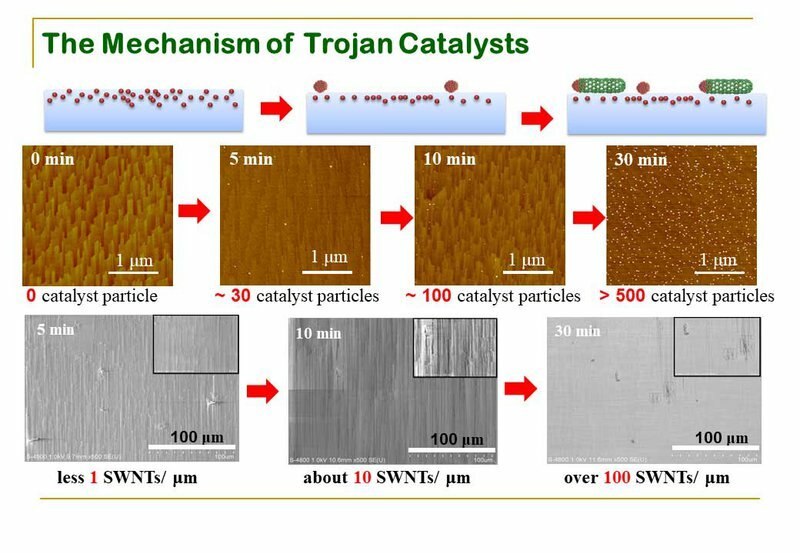 Our problem is that the Trojan catalyst requires intense heat to dissolve. At a high enough temperature, a lot of these metals tend to liquefy. When the metal liquefies, the molecules begin to distort, and because of that, we will have great trouble controlling the structure and chirality of the carbon nanotubes we are growing. How can we realize and control the chirality, despite the heat, while growing carbon nanotubes? 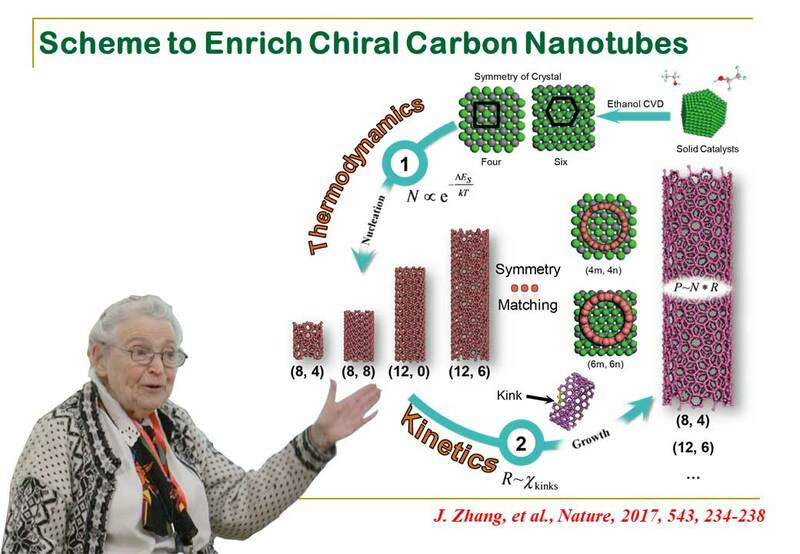 Here, I’m just summarizing the progress of catalyst design and chirality controls in the growth of single-walled carbon nanotubes. Notice that from 2002 to now, most people are working on chirality control. This is a diagram displaying the transition of different types of catalysts and growth models over time, as well as the mechanisms to control the growth of carbon nanotubes. Notice that the earlier catalyst designs contain more of a liquid catalyst, while the later designs had more of a solid catalyst. The growth model changes from VLS mechanism to VS model. Under most circumstances, the growth process can be controlled thermodynamically and kinetically. Also, keep in mind that although we are currently talking a lot about heat and the thermodynamics of phase transitions, chirality is not influenced exclusively by thermodynamics. Chirality can be affected by anything that changes the way in which the molecules are connected together, such as an unfavorable chemical reaction between the catalyst and the substrate material. 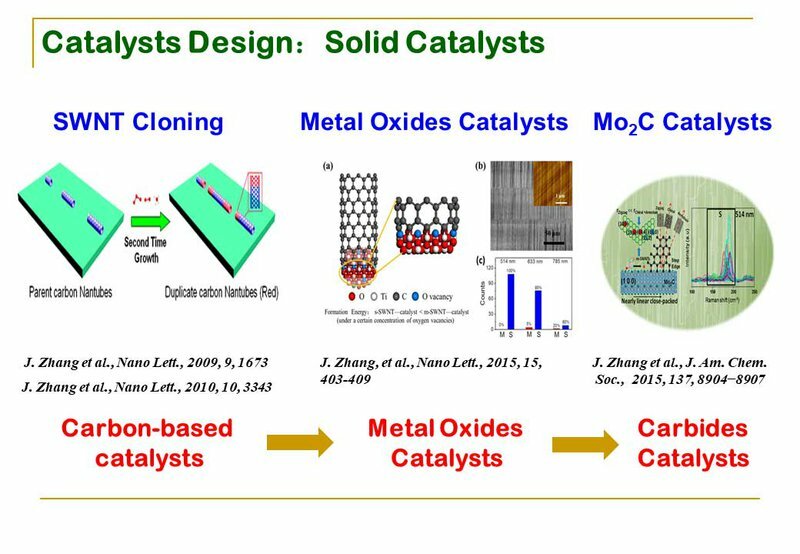 Thought about in this way, it makes sense why our lab is working on solid catalysts formed from combined carbon-based catalysts, and on metal-oxide catalysts formed from combined catalysts. 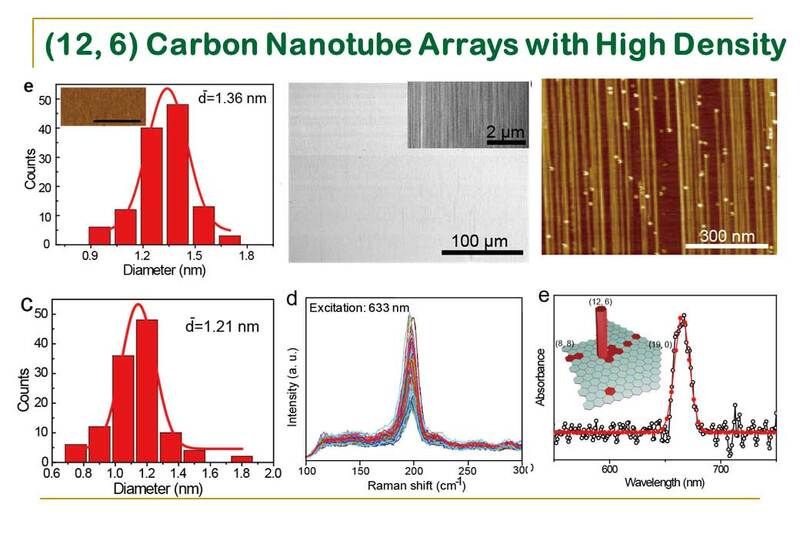 Now, let’s look at how to use a carbon catalyst to grow carbon nanotubes. I encourage all of you to look into the literature and take a peek at the structure of a carbon catalyst and a carbon nanotube. If you do, you’ll notice something: the symmetry is exactly same! Is this a coincidence? 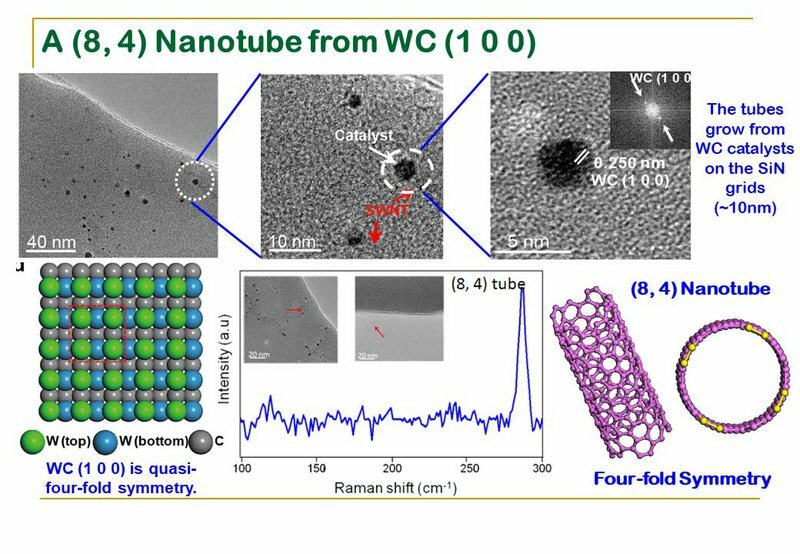 Or is it an indication that, perhaps, during nanotube growth, the symmetry is very important for the nucleation of carbon nanotubes on the catalyst? I think it’s fairly clear that it’s the latter. Let us think outside the box, for a second. I know we’re talking about growing nanotubes, but let’s put that aside for a minute and, instead, flip through a textbook about crystal growth. One of the things you’ll find, there, is a phenomena called ‘crystal overgrowth’ — a phenomena in which high temperatures can cause certain points on the surface to accumulate growth faster than others, and those growths tend to have the same orientation as the substrate upon which they’re grown. If your ears perked up at the phrase ‘same orientation’, you’re not alone. We’re looking for a way to control orientation, and the crystal growers appear to have found one. So let’s investigate. Why does it do this? Well, it turns out, it’s all a matter of symmetry. If you have two connected crystal faces, the rule says that a similar symmetry will be shared between them both. Can we apply that to growing nanotubes? That’s the theory. 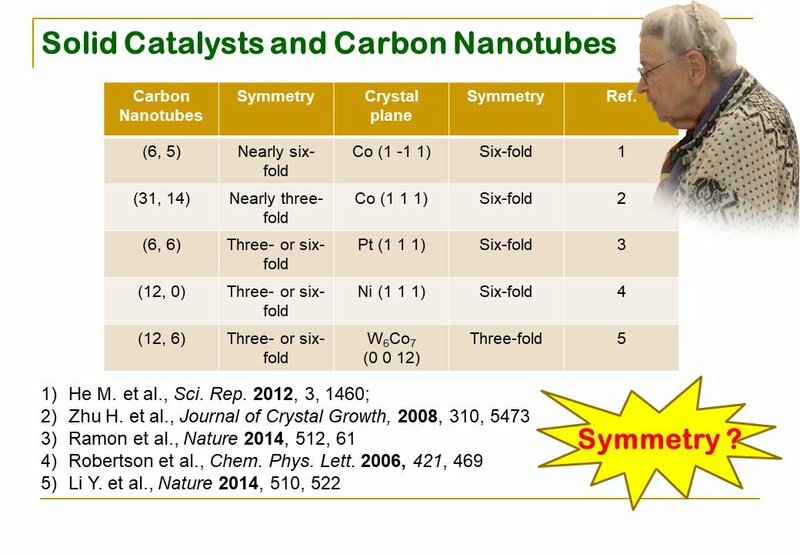 If we could connect the face of the nanotube and the face of the solid catalyst, perhaps that would cause the nanotubes to have the same symmetry as the catalyst. 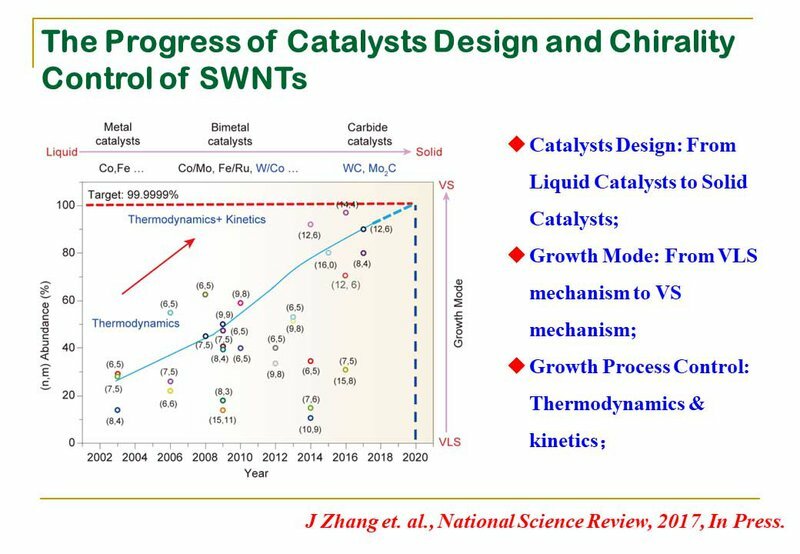 First, we must control the catalyst during the growth of the nanotubes, to ensure that all the nanotubes wind up being the same size. Second, we must make sure that thermodynamics (high or low temperature) does not interfere with the chirality of our nanotubes — in other words, we must confirm that the nucleation of the nanotube matches the symmetry of the catalyst, regardless of whether the temperature is high or low. 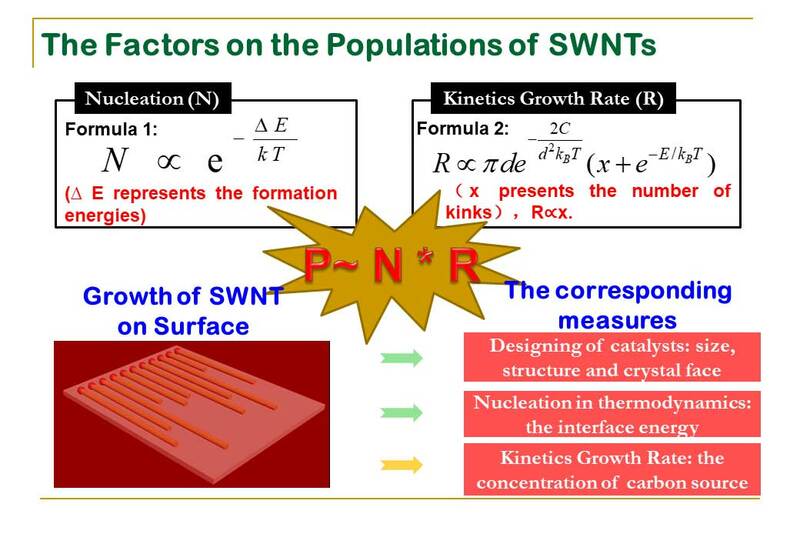 And third, we must control the growth rate of the carbon nanotubes. 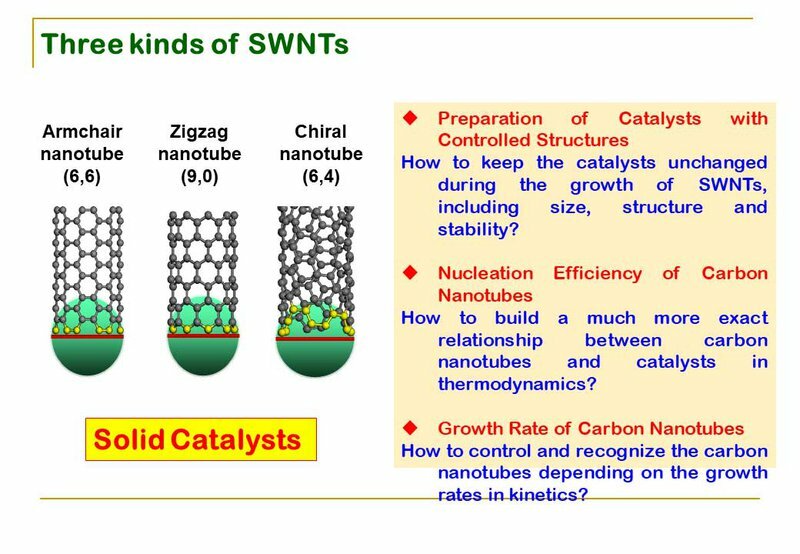 Let’s tackle the first problem: controlling the catalyst during the growth of the nanotubes, to ensure that all the tubes are the same size. How do we do this? We’re going to use an entropy-driven spontaneous mono-dispersion process. For example, on the sapphire substrate, we can put MoO3 on the surface, and at a certain temperature, you can get the mono-dispersed MoO3 on the surface. If we now introduce some carbon sources, that would change the molecular bonding of the materials, allowing us to get the same size catalyst that we can use to grow our nice, big, high-quality nanotubes. Our second problem: ensuring the nucleation of the nanotube matches the symmetry of the catalyst, regardless of high or low temperature. To do this, we must first take on some important calculations. We have done this as a collaboration. So let’s look at the chiralities. We can have a zigzag tube, an armchair tube, or a chiral tube, depending on the different chiral angles. You can just about see how we calculated the symmetries. 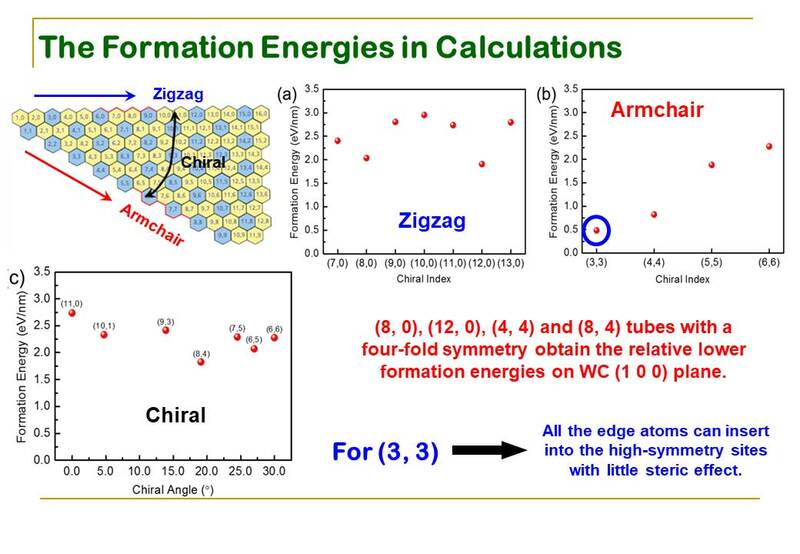 Remember that tubes with a four-fold symmetry obtain the relative lower formation energies on the WC (tungsten carbide) plane. Most of them are four-fold symmetry. We tried to use experimental data to confirm this kind of symmetry matching. In this slide, you can see we’re using tungsten-oxide carbon materials. It does appear, from the Raman, that there is a four-fold symmetry — most of the carbon nanotube symmetry is also four-fold. And from the TEM image, you can get enough direct evidence to definitively say, “That is the catalyst, and those are the carbon nanotubes; that’s the symmetry, and you can see it’s clearly a four-fold symmetry.” So all this means that we can use a different catalyst with a different symmetry, and the nucleation efficiency on the chiral catalyst will be high. Back to how to grow a carbon nanotube. A quick review: to create a nanotube, you need to control the size, you need nucleation, and — the third thing — you need a controlled growth rate. Let’s talk about that one. For the growth mechanism, we use something called the Screw Dislocation Theory, which means that if you look at the tube end and spot the differences (or the kinks) — with more kinks, it grows faster. So the calculations told us that the chiral angle = 19.1, which means there are more kinks, so we can use the theory in order to control the growth rate and reach all the tubes we’ve had where the chiral angle = 19.1. When we did this in experiments, we also got the same result. Using all of that, we can get this kind of design for a process to create nanotubes. First, we can get a catalyst and choose the type of symmetry we want. Using different symmetries, we can control the thermodynamics. When the symmetry is four-fold, it can trigger nucleation matching the symmetry of the catalyst. Well, I’m only using four-fold as an example. The idea is that you could select a catalyst with four-fold or maybe six-fold symmetry, and when nucleation occurs, that four-fold or six-fold symmetry would still match. And, in the final step, we can use our kinetic control to control the growth rate. 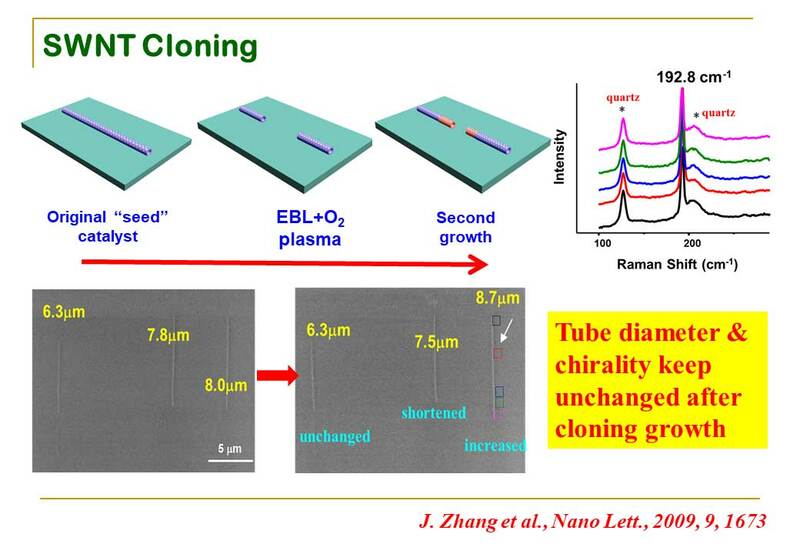 We tried this process ourselves, aiming for chiral indices of (12,6), and we found that the tubes were all horizontally aligned, metallic single-walled nanotube arrays — grown at a very high density — and that 90% of our nanotubes had the properties we’d aimed for! You can see, on the slide above, that the Raman spectra show what I’ve just explained. 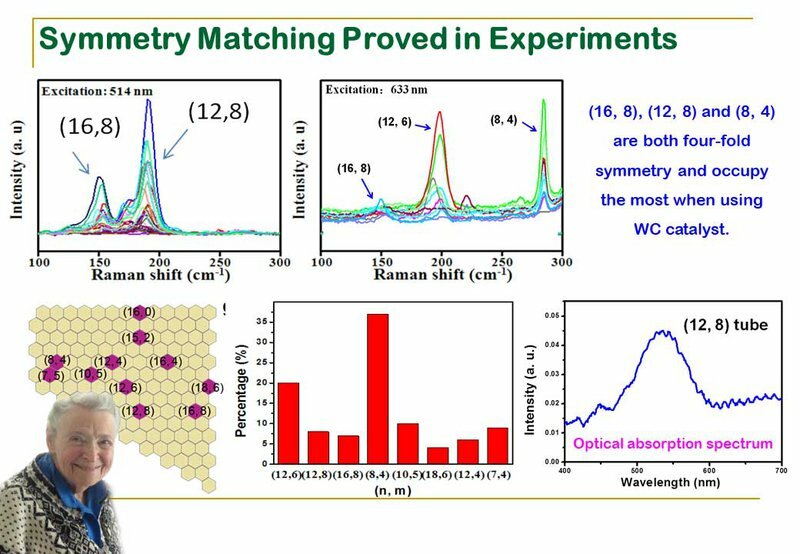 We also changed our nano-catalyst to get nanotubes with chiral indices of (8,4), and you can see the results on the slide above! 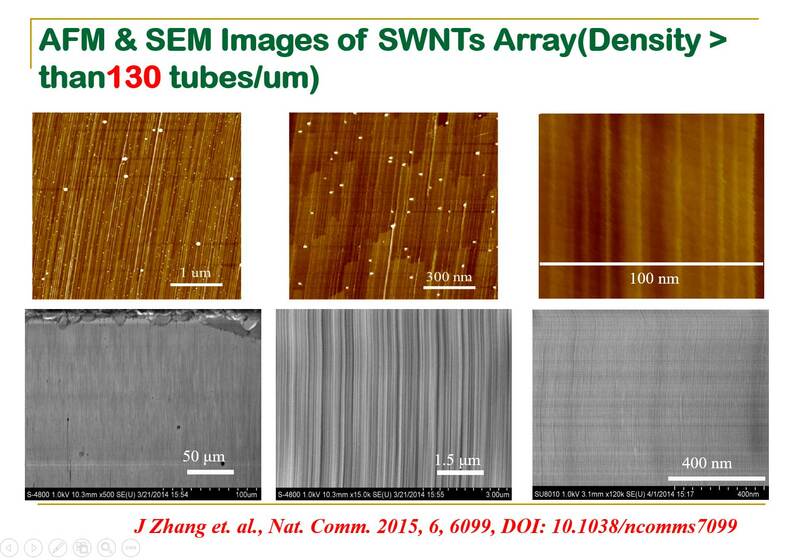 We created these semiconducting single-walled nanotube arrays at a very high density, too — an average density of over 10 tubes per micrometer. And 80% of the nanotubes we created had the correct chirality. Now, as you know, a carbon nanotube can be a zig-zag tube or an armchair tube. Using our specially-designed process, we can only grow nanotubes with chiral indices of (2m,m), where m is a positive integer. What does this mean? It means the first chiral index must always be double the second. 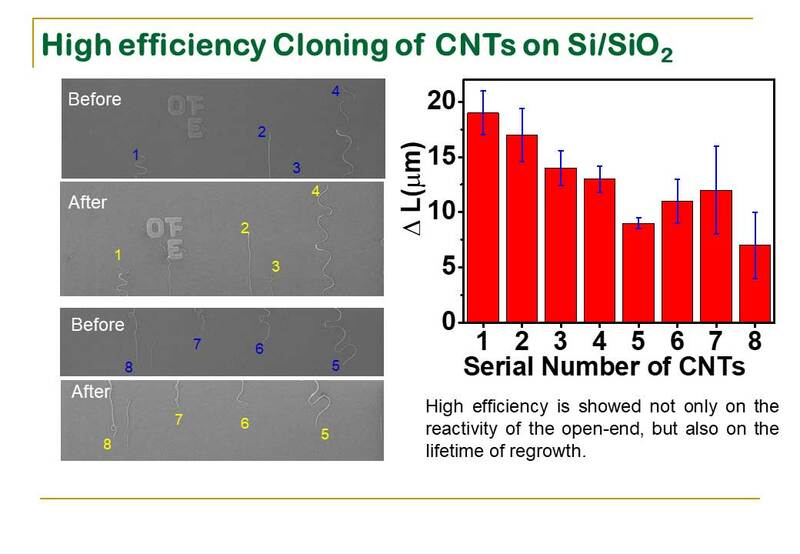 So we can grow nanotubes with indices of (4,2), (8,4), (12,6), etc. But this is an annoying limitation, because these aren’t the only options that are open to us! According to symmetry matching, many different tubes should be possible, such as (n,0) tubes, (n,n) tubes, (3m,m) tubes, etc. Just to follow up on this idea, very recently, we found a way to control a (n,n-1) tube. That is a very exciting new advance, because a (n,n-1) tube will always be a tube with semiconducting properties. So all-in-all, you can see how our process really can predict the chirality of carbon nanotubes. And finally, I’ll just show you another way to grow nanotubes using Carbon Nanotube Cloning. We came up with this method about ten years ago, so it’s a little old, but it does work. 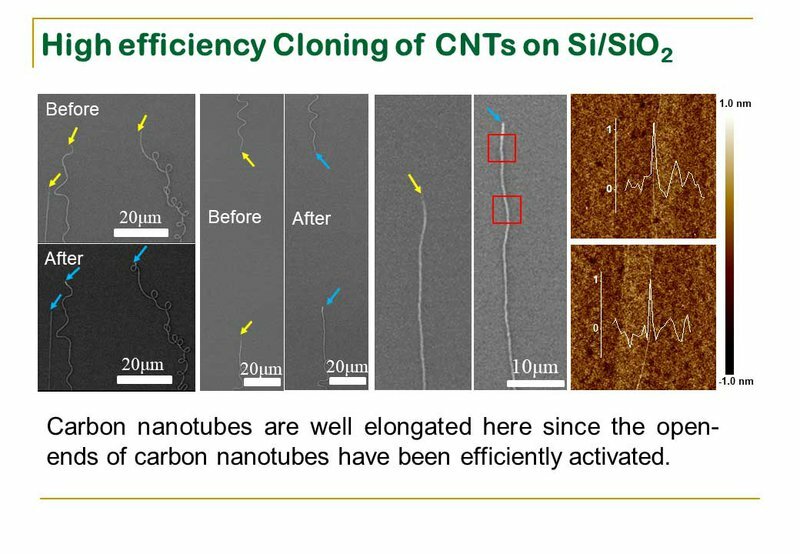 In this method, we can grow a carbon nanotube on a surface by cutting the tubes so that they’re very short, and then you’ll see that growth will actually continue on the ends of the cut tubes. That’s new growth — a carbon nanotube with a similar structure to the original one. Unfortunately, with this method, we can't control the chirality of the carbon nanotubes at all. But the biggest problem is that the efficiency is very, very low. 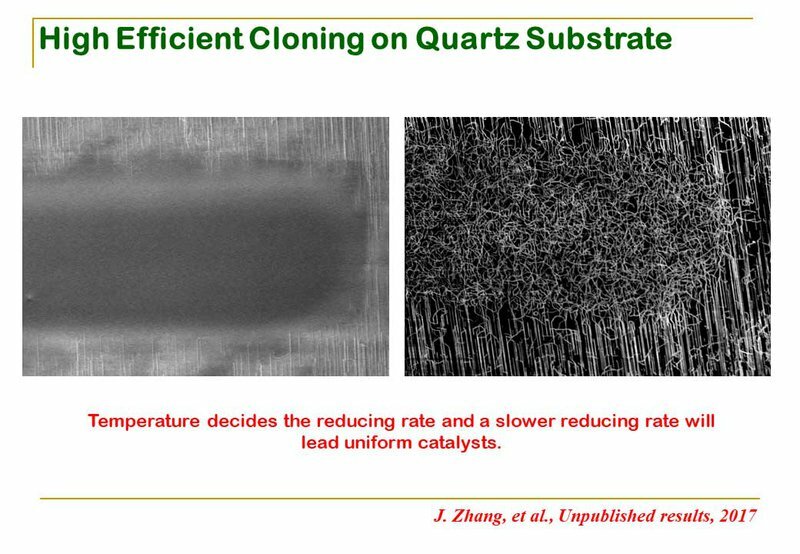 However, very recently, we found another way to get the nucleation to happen at the end of the carbon nanotube, so we can get a very high efficiency while cloning the carbon nanotube on the zinc-oxide substrate. Here, I show you 8 carbon nanotubes. After the second growth, the length of most older tubes increased by at least 5 micrometers to 20 micrometers. In this way, we can get the nanotube array on the surface, and then we can cut the tubes and grow them a for second time, with the original growth as the seed. Many tubes can be grown with one seed! This helps us realize two things. First thing: in terms of nanotube growth, there is a way to grow nanotubes without using a catalyst. 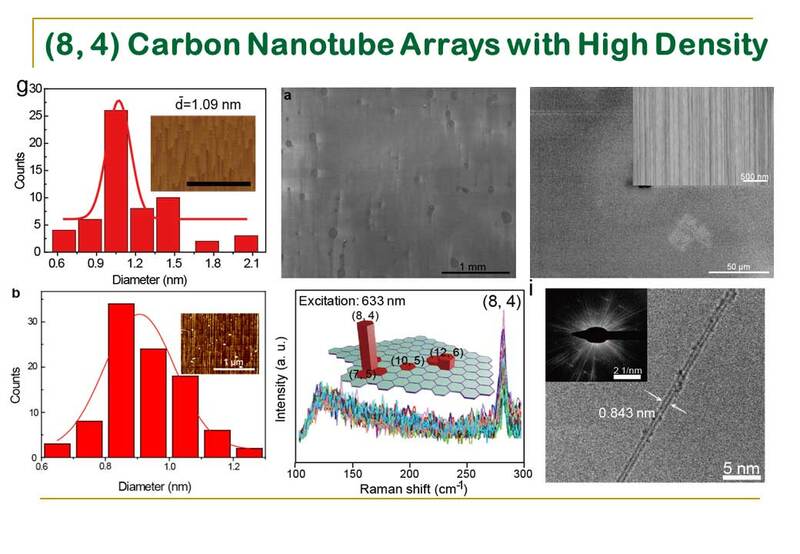 Second thing: we can control the structure of carbon nanotubes — not only for the individual carbon nanotubes or nanotube arrays, but also for large amounts of carbon nanotubes. I think this might have good applications in the future. Let’s summarize all this. 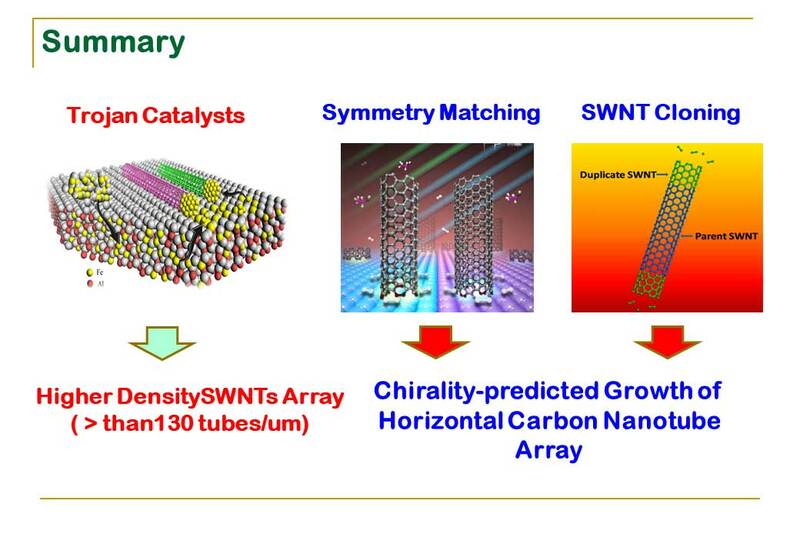 First off, using the Trojan catalyst, we can produce a high density of nanotubes on a given surface, and, using symmetry matching and single-walled nanotube cloning, we can accurately predict its chirality, and then we can expand the tubes into a nanotube array. I would like to acknowledge all the help I’ve had from collaborators and students. And before I go, Professor Maruyama-sensei mentioned that next year, we are organizing the NT 2018 conference at Peking University — and all of you are welcome to join us! Esko Kauppinen: Any questions? Yes, please! Question Asker: In the case of cloning, you put it back in the reactor, I suppose, and do more CVD, but — what prevents the additional carbon from just coating the outside of the parent single-walled nanotube and merely fattening it, like paralytic graphite? Why does it grow on the edges? Jin Zhang: Yes. I understand your question. There are several different techniques we have to grow nanotubes. You’re mentioning one of the ways, in which we use the initial tube as a seed to induce continued growth. But your question is why does the tube grow outwards at the end, instead of getting fatter? I don’t know why, but I have tried it experimentally many times, and it always does that. The thing is, this is all original work, so we’re still working on this. The oxygen plasma cuts the tubes short, but that may cause some of these tubes to close (becoming buckytubes, as Millie would say). But at the moment, we are experimenting with other methods to induce functional growth at the ends of these cut carbon nanotubes. Of course, it’ll require a high temperature. There’s also positioning that needs to be taken into consideration, so that when another carbon atom comes along, it can continue to build onto the end. But we’ve gotten results with no problems. And just to follow on with this kind of idea, we are also using something that we call the “gas phase.” We just use a small number of nanotubes and put them into a chamber in order to promote continued growth. We would like the structure to be controlled for all nanotubes, not only the new-growth nanotubes. Esko Kauppinen: Another question, please. Question Asker: Thank you very much for this very impressive work. 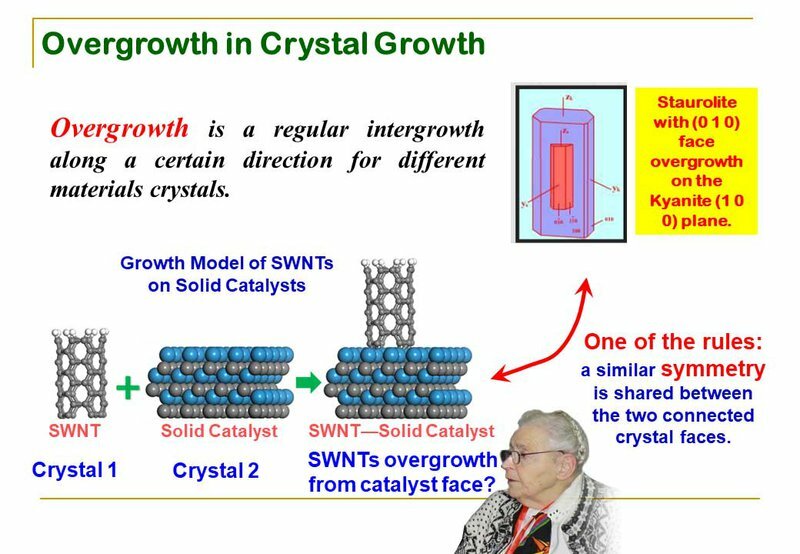 I was wondering: what is the effect of the catalyst size for lattice matched growth — or overgrowth? Jin Zhang: That’s a good question. It’s actually not so easy for us to measure that directly, but what we have found is that the catalyst depends on the substrates. If you choose a rough substrate, it is really not so easy to get this kind of phase. So it’s not so easy two grow two (m,m) carbon nanotubes. The way in which we are using that sapphire substrate and the way we are using carbon materials allows us to get this fast (it seems), and that allows us to get the two (m,m) carbon nanotubes. 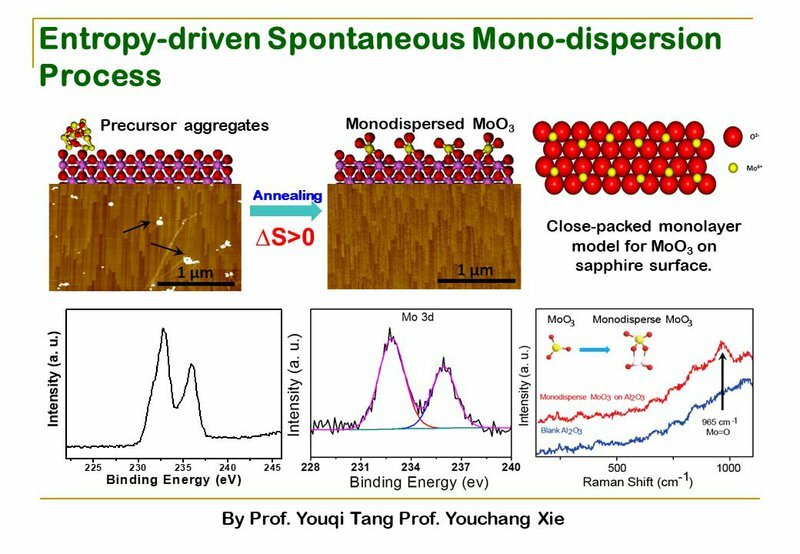 Question Asker: But the catalyst particles are not mono-dispersed, right? Jin Zhang: We still cannot mirror that one. I do not think there's a large one. Maybe there’s a very, very small one. Of course, we are using TEM to follow this one. We would like to use TEM to look at the in-situ growth method, eventually, but we are not able to gather results now. Esko Kauppinen: To save some time for the panel discussion, let’s stop here and thank the speaker.